Are you a Family descendent? 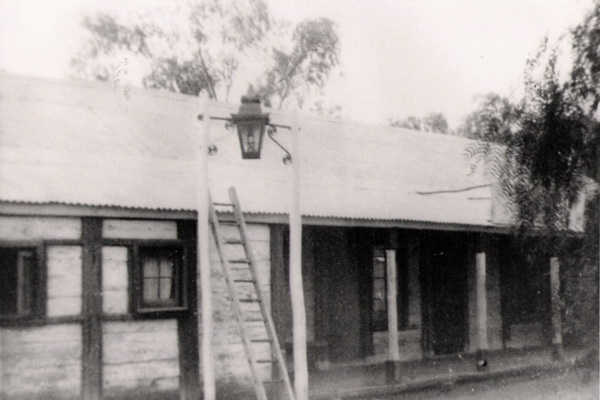 We are researching the Rogers and Geyer families who have connections to Old Tintinallogy; a forgotten settlement on the banks of the Darling River between Menindee and Wilcannia. The families we are concerned with are the descendents of William Thompson ROGERS (c.1828-1876) and Elizabeth Irvin nee WHITE (c.1830-1880); and Heinrich Christian Freidrich GEYER (c.1822-1891), his first wife Frederika nee KNIPPERT (c.1822-c.1857), and his second wife Anne nee COGHLAN (c.1835-1922). The families connect through Henry GEYER and Margaret ROGERS who married in 1876 and resided at old Tintinallogy. 'We' are Phillip Treweek, the author of this site, and Mary Wilson, who have been involved in researching these families since 2006. This web site is intended to bring together family members and people who have information on the family. We are keen to make contact with these people. Feel free to have a look through the information presented in these pages. If you think you might be one of us, or can help with the research, then please contact us at treweek@cs.waikato.ac.nz . Since you've found your way to this page, I assume you have an interest in the history of this area, or these families. For more details, see the pages in the menu at left. The information presented here is a basic outline of what we know about the familes. The plan is to eventually produce a book. In the meantime we produce a periodic newsletter of findings from our research. If you would like to receive the newsletter, please contact me at the above address. Disclaimer: Please note that this information has been obtained from numerous sources both primary and secondary, through my own work and the works of other researchers. Sources are noted where possible. The information is provided in good faith, but as with much family history there are no guarantees of accuracy.